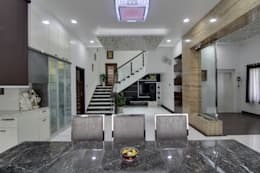 Home / UncategorizedAn elegant home full of style in Hyderabad!! Elegance is a virtue that clads personalities, home and art with equal aplomb. An elegant home is one that brings together neat lines and lavish elements to create a scene that tells an eloquent tale. 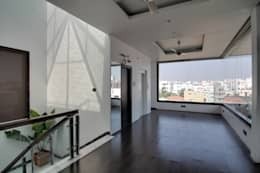 This residence by Kreative House – a team of architects in Hyderabad – is a simple canvas that imbibes this very quality. Designed and rendered for Mr Reddy, this home is a vision in gleaming grey with touches of luxury and a strong classical character. Read on to explore more! The dining area of the residence is a spell-binding space that has been dressed in white and grey. Stone and marble follow the eye here too and make an appearance on the table top. The granite glistens stylishly under the well appointed lighting that flanks the ceiling to cast a glow over the entire area. Upholstered chairs in a steel frame make for a solid yet elegant look. The kitchen sits to one side, with overhead lamps at varying heights hanging over the island. The open kitchen has a bank of appliances in shining white and chrome, while glass and wood come together to create a sophisticated space. 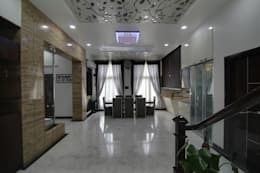 As you saunter into the lobby and the main hall of the opulent and well-appointed Reddy residence, the beauty of the space looks you straight in the eye and invites you to literally sink in. Glass and stone tiles have a wonderfully lavish effect while white marble adorns the floors. The expansive space is uncluttered and makes the most of its classic furniture and drapes as it lets the eye wander, unhindered, over the designer feats achieved in this space. The sandy coloured golden wall in a stone tile accentuates the opulence by leaps and bounds. A stencilled niche in the ceiling welcomes visitors to the artistic environs as well. The best part about the Reddy residence is the fact that its main hallway has an open layout. The kitchen has been left open and the entire hall has an open look with the dining room and staircase placed on opposite side, with a joyful lack of walls. The staircase is a glass and wooden affair that has a solid look. The clean lines and the fuss free look blends in very well with the overall elegance of the home. Once you reach the apex of the stairs, you will not be sure what to stare at first – the amazing vista of elegance and luxurious architecture, or the grand view that faces you. The glass and wooden staircase leads you into a space that could very well feel like a walk in the clouds. The glass windows that flank two walls make for a view to die for. The recessed niches in the ceiling make an appearance here too and visually lift the space to heights of dramatic design. White walls and a prismatic play of natural light on them create a stunning effect. A potted plant to the side with its wide leaves adds a natural touch to the space. Style, elegance and a generous sprinkling of luxuriousness create a beautiful canvas in this residence. The Reddy residence has been designed with a minimal look that also has a classical vibe. The classic elements help add an elegant touch to the entire space. 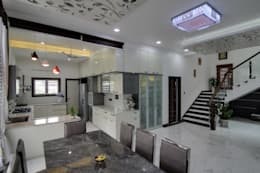 The best part about the design of the home lies in the fact that it ushers in a sense of calm even as the luxurious surroundings envelope and excite the senses. The stylish surroundings will make you stop and breathe in the wonder of design that has been achieved. The play of glass, stone and wood heightens the drama as it unfolds and reaches a happy yet designer ending! ← Tips to decorate your blank wall!! A Beautiful Eco-friendly home !! All you have to know about Green Architecture! !